The Brighton Sports Stadium, or S.S. Brighton as it was often called, opened on the 29th of June 1934. The stadium was built on the site of a former inn, the King's Head, which was demolished in 1933. 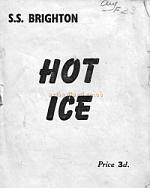 Right - Programme for 'Hot Ice' at the Sports Stadium, Brighton. 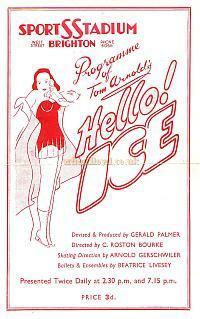 Far Right - Programme for 'Hello! Ice' at the Sports Stadium, Brighton. The stadium was built as a large covered swimming pool, using sea water rather than most of today's fresh water pools, but locals seemed to prefer the real thing and used the sea instead. Consequently the management decided after a short time to try using the facility as an Ice Rink instead. The Ice Rink opened in October 1935 and was an instant hit. An Ice Hockey Team was soon started, called the Tigers, and they continued with great success for 30 years, but another entertainment was soon to dominate the stadium too; Ice Spectaculars. Left - Back of Programme for 'Hello! 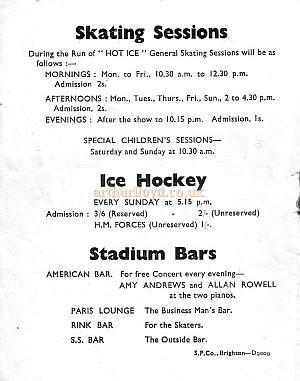 Ice' at the Sports Stadium, Brighton, showing the times for Skating Sessions, Ice Hockey, and details of the Stadium Bars. The end came for the S.S. Brighton in 1962/63 when it was closed for the last time and demolished. The site today is home to an Hotel. Above - A Programme detail for 'Hello! 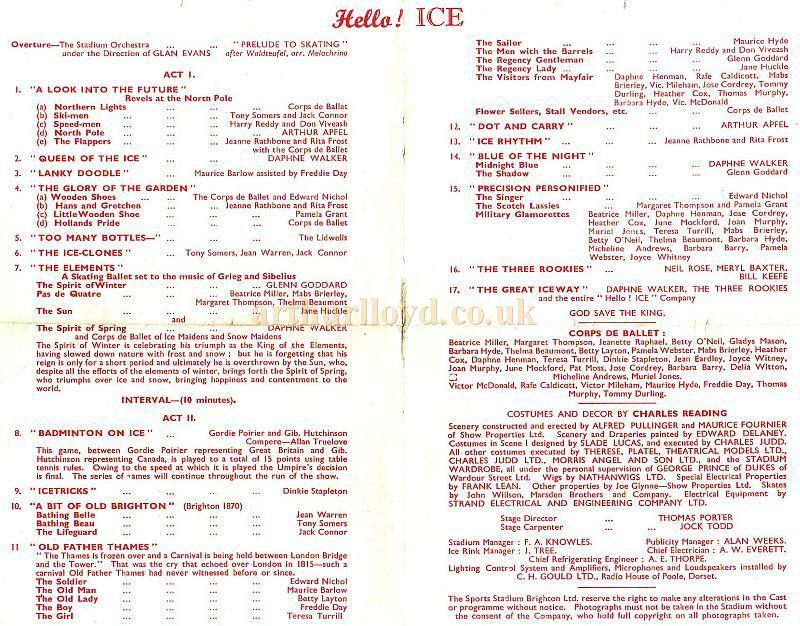 Ice' at the Sports Stadium, Brighton, with cast list and the acts in this Ice Spectacular.